Secular choral music for man's choir composed by Various. Edited by Armin Kircher. Choral collections. Mozart/Haydn 6. Chorbuch weltl. TTBB) Einzelex. Choral collection. 80 pages. 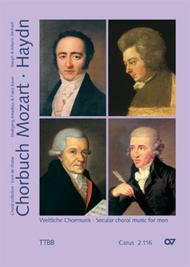 Published by Carus Verlag (CA.211600).ISBN M-007-09425-6.For social gatherings, gentlemen's evenings with his friends, Johann Michael Haydn wrote settings of German songs for equal voices, and thus he founded the new genre of the men's quartet. Volume VI of the Mozart - Haydn series brings together works from the early years of the men's quartet, including Johann Michael Haydn's most beautiful pieces for men's choir, arrangements as well as original compositions by Joseph Haydn, Wolfgang Amadeus Mozart and his son Franz Xaver. The themes of the Lieder are varied: songs of love, nature, friendship, and of course, wine.